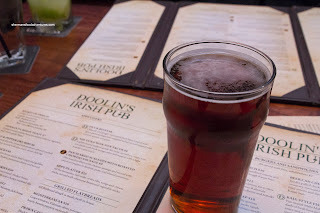 My original visit to Doolin's could be summed up with one word - foggy. No it wasn't misty outside nor was I concussed. Rather, I barely remembered it (you guess why) and we only shared a few appies. Hence, I enjoyed my experience (and why wouldn't I???). With it being a gastropub and all, I regretted never being able to sample their "real" food rather than some wings and nachos. Well, that was all going to change as I was given a $50.00 credit to use. I dragged Viv along because taking photos of my food at a pub alone would look outright strange. And no, a beer at my table wouldn't help things because I would be a drunk weirdo taking pictures. So we started with some appies beginning with the Duck Bites which shared some similarities to the Chicken Grenades (from Recipe to Riches). This is actually a compliment because I happen to like the grenades. 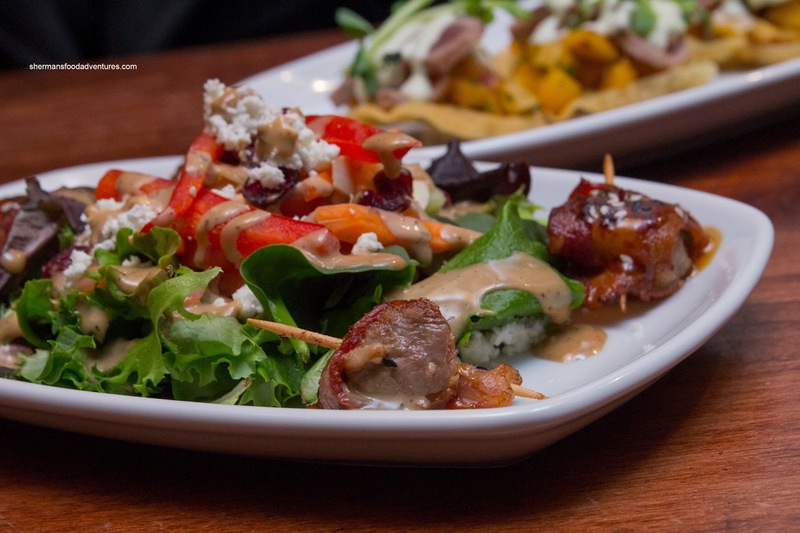 The pieces of duck were wrapped with crispy bacon and kissed by a chipotle & ginger marinade. The flavours were further amped by the a sweet sesame soy glaze and spiced up with pickled jalapenos. We liked how they filled the rest of the plate with a salad as it gave the impression of more food. Next up were the Pan Seared Scallops with Roasted Chorizo Sausage. 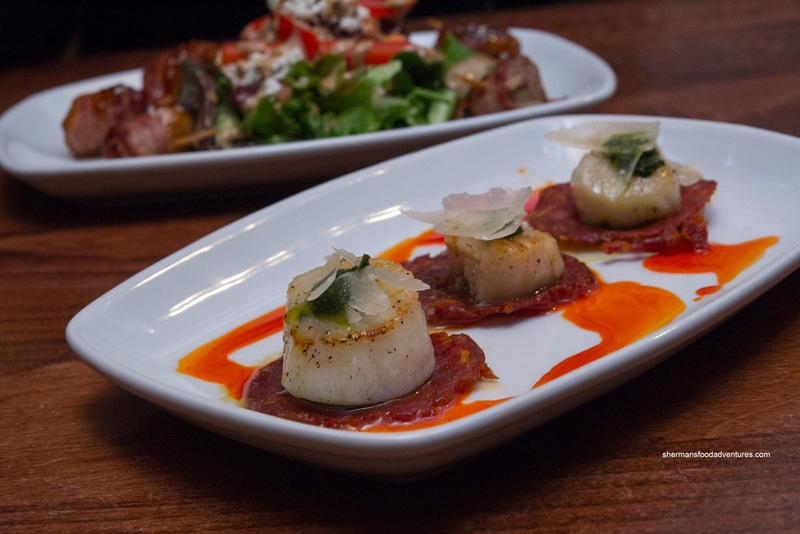 We liked the plating as each scallop was served on a crispy thin-sliced piece of chorizo. It was finished off with pesto, shaved Parmesan and a red pepper reduction. The scallops were buttery soft, yet could've benefited from a touch more sear. We liked the contrast of natural sweetness with the saltiness from the sausage and Parmesan. Although the red pepper reduction looked spicy, it was mostly sweet. For our last appie, we tried the Ahi Tuna Wonton Tacos consisting of lightly seared tuna served on crispy wonton shells with fresh mango salsa and topped with light wasabi cream. As described, the tuna was appealingly rare while the wasabi cream was there but not overpowering. Of course the sweet mango was a nice compliment to the nicely prepared tuna, but the wonton crisps were a bit clunky to eat as they broke apart really easily (and these were not one-biters). 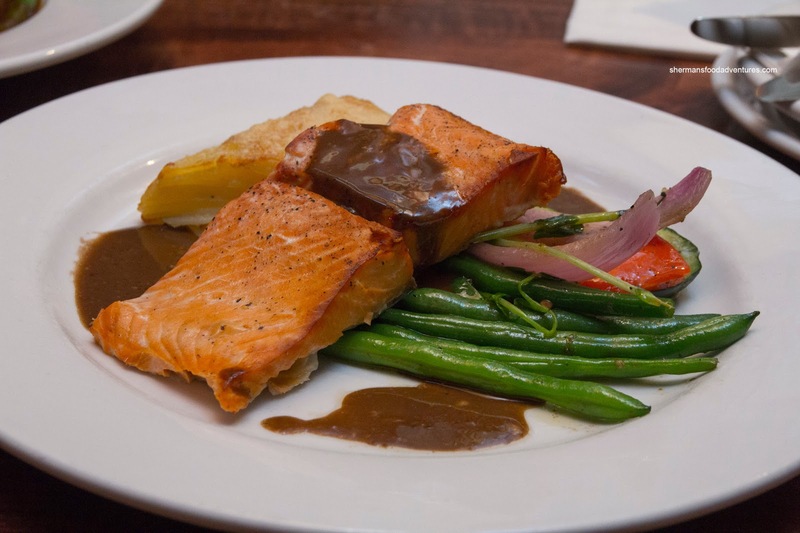 For her main, Viv selected the Smoked Salmon with a balsamic butter sauce served with Dauphinoise potatoes and seasonal vegetables. We found the salmon to a little dry, yet nicely smoked. The balsamic butter sauce was smooth and only slightly tart (wished there was more of it). The veggies were just barely cooked retaining a crunch. As for the potatoes, they were not as rich as one would think (which we liked). We liked the soft texture that was not mushy either. 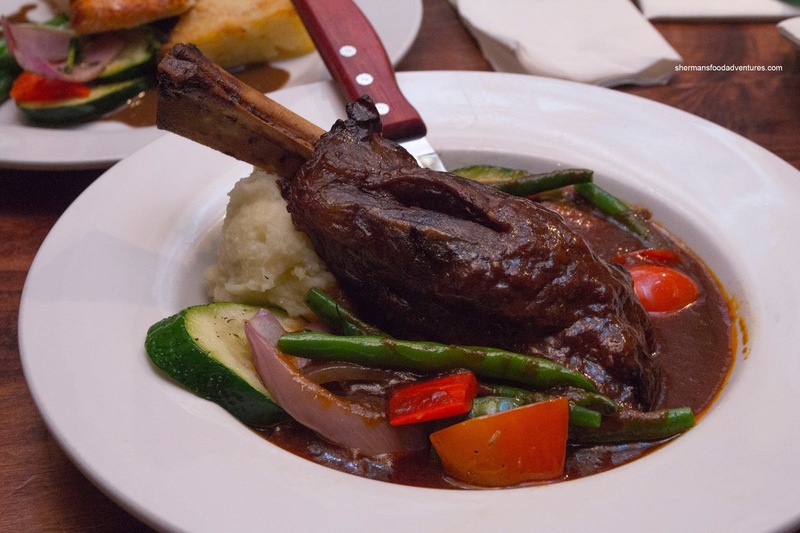 For myself, I had the Lamb Shank drizzled in lamb jus with a touch of red wine served with mashed potatoes and seasonal vegetables. Although there was more sauce than a "drizzle", I personally didn't mind because it had depth and indeed had a rich red wine flavour. The lamb shank itself was massive with plenty of tender, gelatinous meat. 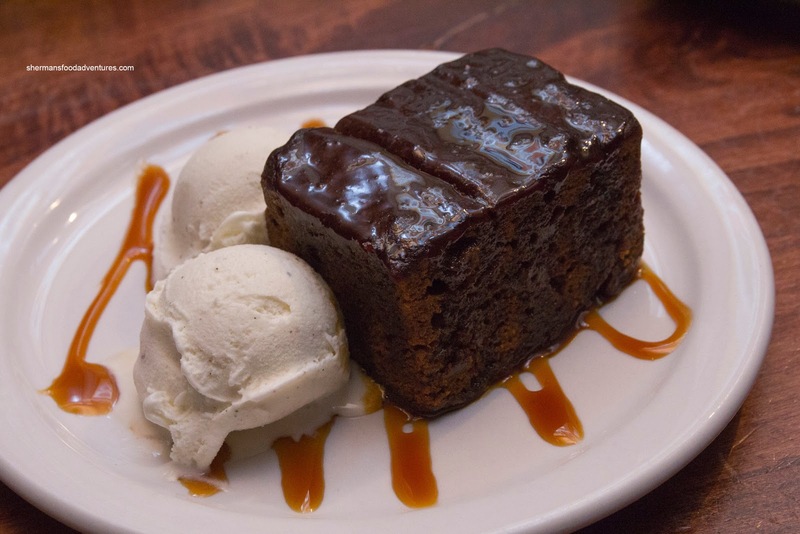 For dessert, we shared the Sticky Toffee Pudding which was moist and full of sweet sticky dates. We found it quite sweet, but that was not unexpected. The vanilla bean ice cream (although sweet itself) helped cut through the heaviness. So after finally eating a complete meal at Doolin's (including a barley sandwich), we were satisfied with the items we had ordered because it exemplified what a gastropub is supposed to be. Oh my poor we bairns! You should have tried their fresh potato chip style nacho's! Looks good!! Especially the tuna taco and the dessert!! Looks like the food has improved over the past few years. I'd love to try Doolin's! I'd like to try this place! I used to work nearby, and I never had the time to go. 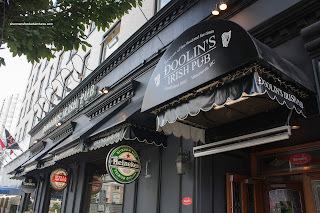 i live three blocks from this pub but have never been there! 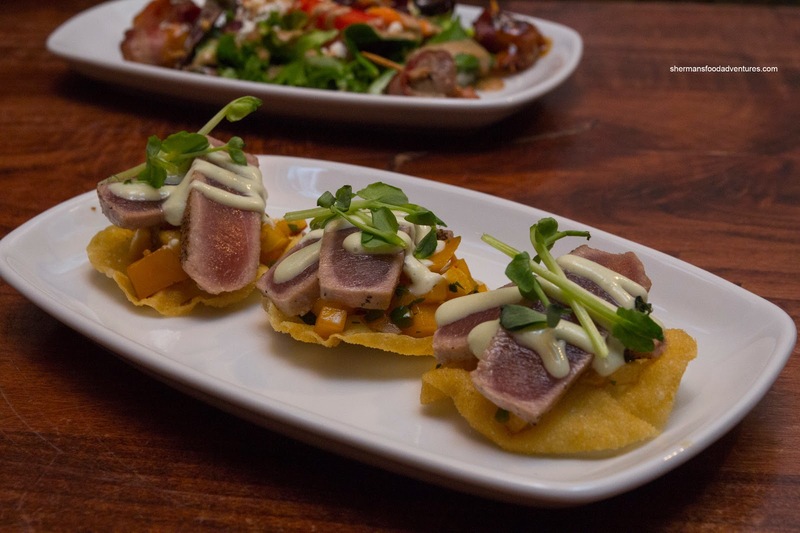 the ahi tuna wonton tacos appeal to me. and that ginormous sticky toffee pudding! Reading your blogs at night is bad for my waistline!